Wow... That's what I call being extremely productive. You know Sweeps. 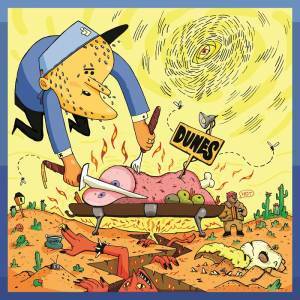 And you most certainly remember Dunes EP, titled after his side project with the lyricist Bill Grease. Well, Dunes don't sit around procrastinating and just 2 months after their debut EP, here's a new one - Verbal Cabbage EP. I'm impressed how mature the EP sounds and I can absolutely sense the progress of them two. There are songs which are a bit deeper and moody - I was really heart-struck by "Verbal Cabbage" and the use of the instrumental of Portishead's legendary "Glory Box". And must say "Ain't Livin' In The Past Now" and "Cold Game" are thoughtful masterpieces. But at the same time in "Never Heard" you can definitely hear their recognizable fresh and jazzy sound from Dunes EP. So, after all, I am sure everyone can find their vibe in this amazing EP.